Last to ride in Mechelen at the end of December, the pressure was on for Hans-Peter Minderhoud, the Dutch Dressage athlete. Having made the podium at Olympia just a few days before, he now had in front of him the opportunity to win a FEI Dressage World Cup™ event for the first time. Thankfully his partner was the reliable Glock’s Dream Boy. Laying down a programme that highlighted both artistic subtlety and precise equitation with tremendous fluency, Hans-Peter and his ‘Dreamy’ garnered an 83.665 from the judges to edge past Helen Langehanenberg and Maria Caetano for a famous win that further indicates a big future for the 11-year-old stallion. See his full pedigree when you sign into your FREE MyFEI Space! The black, KWPN, Dressage stallion was born on July 9, 2008, by Vivaldi, out of the dam Resia. Dream Boy was the first licenced offspring by Vivaldi in the Netherlands. In the early days he was trained and competed by Gerdine Maree. In 2013 when he was just five, Dream Boy finished fourth in the 2013 Pavo Cup Finals and 14th in the 2013 World Young Horse Championship Finals. In 2014, as a six-year-old he won a bronze medal at the World Breeding Dressage Championships for young Horses in Verden. He was second in the 2014 KWPN Stallion competition. In January 2016 he moved to Minderhoud’s stable and six months later they won silver at the 2016 Dutch Small Tour Championships in Ermelo. It seems his attitude, flair and behaviour have turned their partnership into the dream team. In 2017, Austrian businessman Gaston Glock secured co-ownership of the stallion, alongside Tim Coomans, Jacques Maree and stable Brinkman. Glock's Dream Boy is a sought-after stallion in both the Netherlands and Germany and with good reason; he’s so far sired five KWPN approved stallions. His foals have been described as long legged and radiant. To be successful at the same time in two careers is impressive, but he’s still a horse, not a machine. With his sports career on the rise, Dream Boy’s owners are not afraid to put his stallion duties on hold. This was the case in the build up to FEI World Equestrian Games™ 2018 in Tryon, USA. Glock and the other owners withdrew him from stallion duties while he was in such good form in the Dressage arena. Although he was far from a podium finish at WEG, finishing 20th, he hadn’t been at Grand Prix level very long. It’s clear from his record, this boy is being carefully produced. His owners have a firm belief in him and all he has to offer. This is still the early stages of Dream Boy’s career and the excitement around his potential stardom is palpable. His results are on the ascendency and each performance is an improvement on the last. After Tryon in September he went to London Olympia for the FEI Dressage World Cup™ at Christmas. Dream Boy finished third in the Freestyle and won the short Grand Prix. 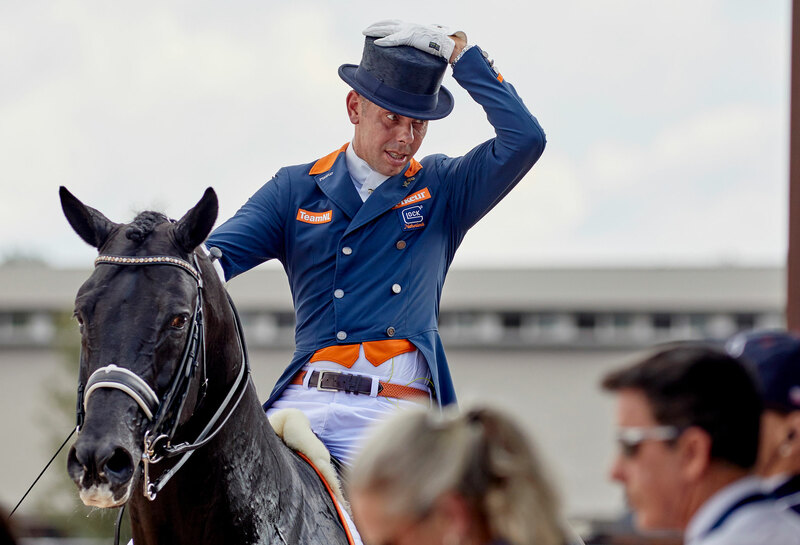 Dream Boy was then crowned the winner of the Grand Prix and Freestyle in Mechelen which was leg 7 of 10 in the FEI Dressage World Cup™ Western European League. It means he has qualified for the prestigious FEI Dressage World Cup Finals in Gothenburg in April. In 2018 he became part of the N.O.P, the Dutch Olympic Horse foundation. This prevents Dream Boy from being sold abroad to a rival, competing, country. The selection committee clearly think this horse has a big international future which could be peaking perfectly for the Tokyo in Olympics in 2020. N.O.P. chair Leko Sevinga said: “Glock's Dream Boy is only 11 years old, but made a strong international debut last April.